Technology is changing the way we work faster than ever before. Keep up with the latest trends on how to save your team time, increase collaboration and make your business a more attractive employer. At Office Interiors, we are proud to partner with following manufacturers based on the high quality and environmental sustainability of their products and commitment to giving back to their communities. Haworth is a global leading manufacturer of office furniture designed to create flexible, organic workspaces that encourage collaboration and can easily adapt to the changing needs of your organisation. 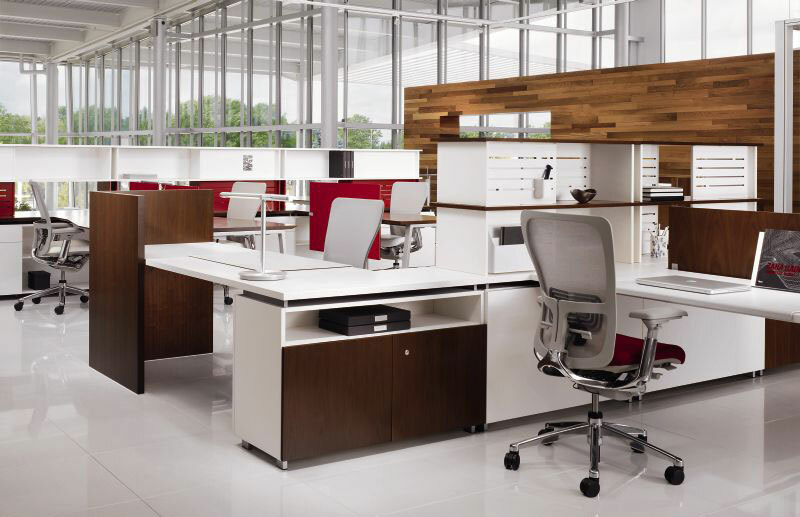 With their wide range of products including systems furniture, seating, casegoods, moveable walls, modular floors and more, Haworth products can truly provide floor-to-ceiling solutions for your workspace. Ricoh, the largest copier manufacturer in the world, are experts in capturing, managing and transforming information. They have a broad portfolio of services, equipment and technologies that help organizations innovate and grow. Whether you are reviewing your office technology needs or redesigning a business process, Ricoh has solutions that will help you be more productive and efficient. Neopost is an innovative leader in mailing technology and solutions, digital communications and shipping services. Their commitment is to help organizations in how they send and receive communications and goods in order to better connect with their customers. Our partner, Panasonic, is a market leader in business communications with extensive experience in manufacturing communications products. Their solutions help organizations to best utilize their existing data networks and infrastructure and improve productivity with the increased demands of a mobile workforce. Humanscale offers innovative, market-leading ergonomic products and accessories. One of our best-selling Humanscale products is the Quickstand, a Sit/Stand surface that can be retrofit onto any existing desk and raised or lowered with a single finger. Lacasse is a Canadian manufacturer of some of the highest quality laminate casegoods on the market. Lacasse products are BIFMA level certified and come with limited lifetime warranties, ensuring that these beautiful casegoods will provide exceptional value for years to come. Sit On It Seating was created to meet the growing industry demand for high quality custom chairs. Sit On It products offer thousands of colour and fabric combinations, extended warranties, and ultra-fast shipping. If you’re ready to start improving productivity, streamlining processes, and love the way you work through optimized workspaces and office technology, contact us today. Our team of experts is here to help!